Ryan Vogelsong and J.T. 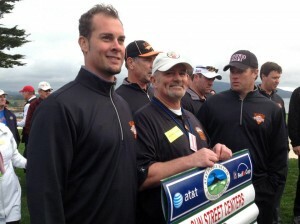 Snow of the San Francisco Giants won first place at last Tuesday’s Chevron Charity Shoot-Out at the AT&T Pebble Beach National Pro-Am. The first place position not only helped the San Francisco Giants win the golf tournament against the competing 49ers, but also helped raise $30,000.00 for Sun Street Centers. Since 1968, Sun Street Centers has worked to prevent alcohol and drug addiction by offering education, prevention, treatment and recovery to individuals and families, regardless of income level. “We are so very grateful and honored that Ryan Vogelsong and J.T. Snow golfed on our behalf at the Chevron Charity Shoot-Out in Pebble Beach! Sun Street Centers humbly thanks these athletes for their commitment to charity and for…the exciting and spectacular win!” said Anna Foglia, Sun Street Centers Executive Director. “During FY 2011-12 Sun Street Centers served over 8,000 individuals and the $30,000.00 that these athletes raised on our behalf will undoubtedly go a long way to support our alcohol and drug prevention, education and rehabilitation efforts in Monterey County,” Foglia added. Support our alcohol and drug prevention, education and rehabilitation efforts in Monterey County! Sun Street Centers is headquartered in Salinas,CA with facilities in Seaside, Marina and King City. Unbeknownst to many, Sun Street Centers, under the auspices of HUD, operates Pueblo Del Mar (in Marina), a safe, affordable, transitional housing community for homeless families in recovery from addiction, including homeless women with children, men with children, and families with children. For further information about Sun Street Centers please call Anna Foglia, Executive Director, at (831) 753-5144 ext. 1 or Araceli Bernardasci, Marketing & Development Officer, at (831) 737-0875. You may also visit us at www.sunstreetcenters.org. Our address is11 Peach St., Salinas, CA 93901.